You want to sound amazing and the musicians want to sound great too – without jumping through hoops to do it! We know just how to write clear charts that musicians can read easily and make them and you sound fabulous. Clear, concise arrangements for cabaret artists & cruise ship acts. We arranged Tom’s cabaret show…..oh and we recorded & produced a No1 selling classical album for him! SMARTassMusic's arrangement of Sinatra's "....Under My Skin" - stage recording of the live band & pre-recorded track. We specialise in creating big sounds without the cost! Large orchestras, rock bands and the sound of a large recording session, just without the budget! 1. Does it look neat? Ok, I have seen bad arrangements that look good, but even if you don’t read music you can tell if the page is clear or tidy. I’ve had to sight read music where the ink clashes all over the place and it’s very difficult to see what you’re looking at. 2. Is there enough information on the chart? 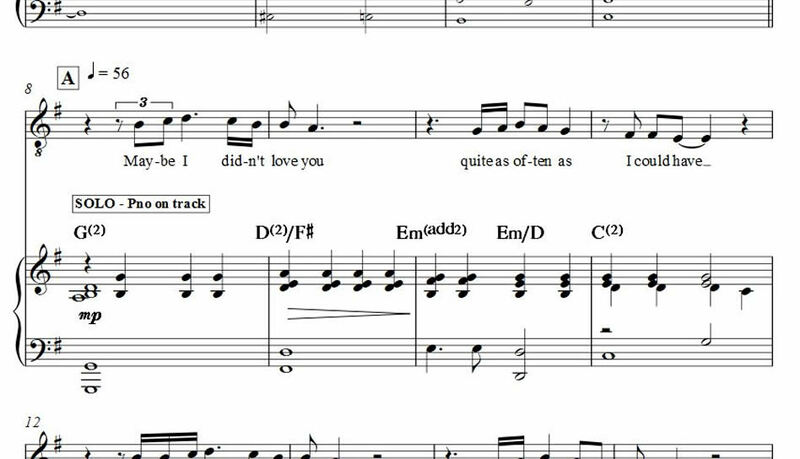 Take a look at the piano part. This is usually the MD part and should show enough information to direct the band. Look out for tempo markings (style/rhythm), the vocal line (just in case things go wrong! 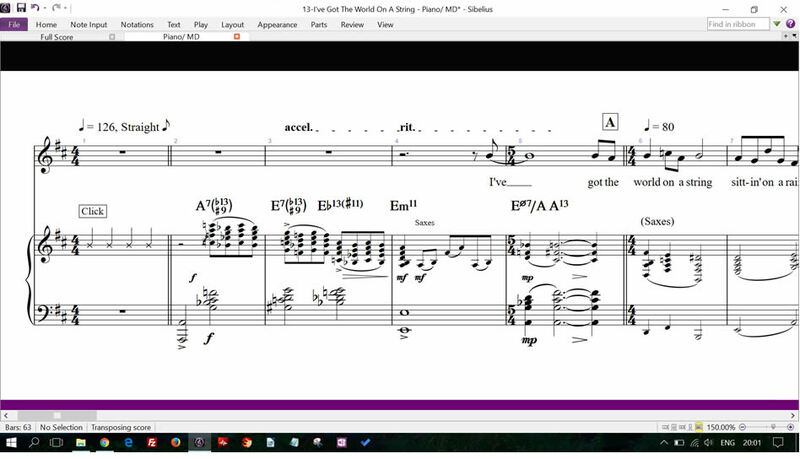 ), cues for the other instruments and cued notes for any missing instruments. Often, many (or all!) of these are missing. 3. Is it the right key? This isn’t just about making sure the arrangement is the correct key for your voice but if you sound best in B major the chances are most cruise ship bands aren’t going to appreciate reading in that key (or be able to!). Bb or C would be much better choices. A good example of this is “Come Fly With Me” by Frank Sinatra, which is in B major. Every time I’ve played this chart it’s been in Bb. You should always be able to hear an audio export of your arrangement. Don’t expect it to sound like a band or orchestra but it should be good enough to check all the notes and in particular, the horns and woodwind, which can be tricky to arrange. Do bare in mind that some parts such as guitar chords or sections of piano may be missing because notation programs don’t read musical shorthand (improvisation) that musicians tend to like to read. 5. Be wary of prices too good to be true. I’ve seen many cheap (and free) band arrangements and more often than not, they’re awful – but some do look nice! 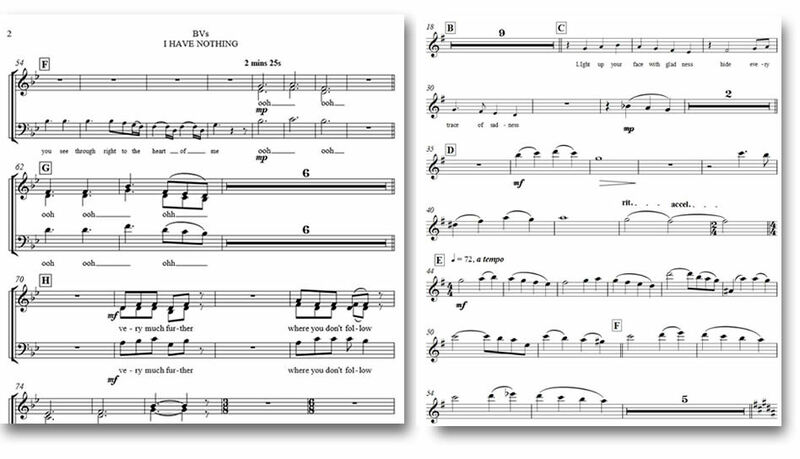 I recently arranged a large quantity of big band charts for a vocalist and to save time he bought some cheap arrangements. It seemed like a good idea but they were so wrong that I just had to start at the beginning and transcribe everything from scratch. I’ve also been on gigs where the arrangement was a cheap version and there was just no information in the piano part to direct the band – simply a bunch of chords, with no tempo marks. What a superb piece of work!!.. I am very impressed with the totally professional, skilful way you have executed this job. Please send your bill….it will be a pleasure to pay for such high quality work.